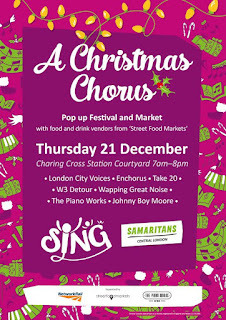 On Thursday 21st The Samaritans is holding a festival and streetfood market outside Charing Cross station. Open from 7am - 8pm, it will feature lots of live music, choirs, and streetfood vendors supplied by Street Food Markets, all helping to raise money to help fund the Samaritans' work. Please support this (& enjoy lots of great streetfood at the same time!). 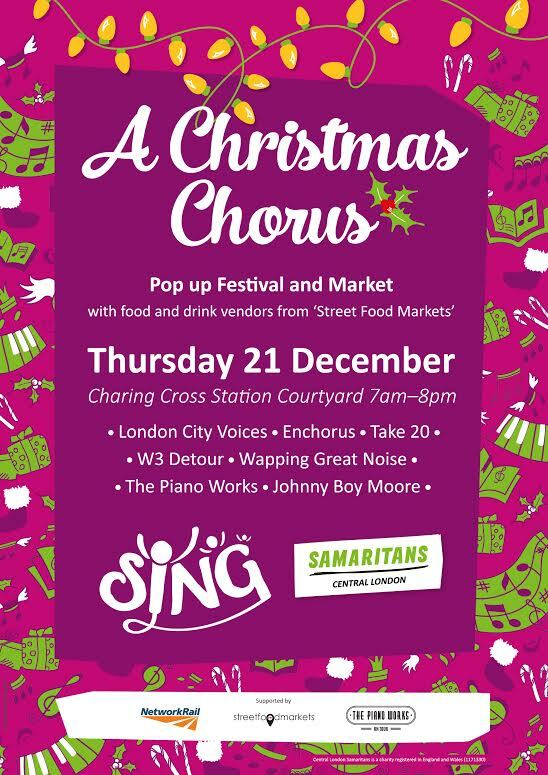 Sing for Samaritans hits a high note with a takeover of Charing Cross Station on 21st December to produce a Pop-Up Festival and Market. Central London Samaritans will, once again, be raising their voices, raising awareness and spreading festive cheer when they take over a central London station with a Pop-up festival on Thursday 21st December. Charing Cross Station will host The Piano Works Live Band, London songsters and London Choirs as part of “A Christmas Chorus - Sing for Samaritans”, alongside street vendors from Street Foods Markets. With the support of the performers and vendors, the courtyard of Charing Cross Station will be transformed into a live music pop-up festival with Choirs singing from 7am welcoming commuters into London. The music continues until 8pm. The event will host exclusive music performances from London’s most exciting talent including London City Voices, Enchorus, Take 20 Jazz, Johnny Boy Moore, Wapping Great Noise, W3 Detour and The Piano Works. The Piano Works set will comprise of festive requests! You can also support us by texting sing17 followed by £1, £5 or £10 to 70070 and help us to help others this Christmas, this year there will also be the option for Contactless Giving.